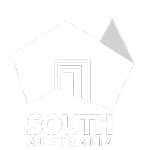 Vinehealth Australia has produced some useful resources for industry operators hosting visitors. These will help you to help improve your knowledge of pest, disease and weed risks and what you can do to address them. 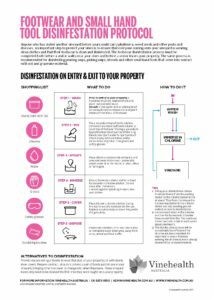 We encourage you to download, print and use these materials in your offices and cellar doors. Include this information in employee induction materials. Footwear poses a risk of picking up and spreading pests, diseases, weeds and soil. Footwear disinfestation is one method, when conducted correctly, which can negate this. Click here to download Vinehealth Australia’s Footwear and Small Hand Tool Disinfestation protocol, which will provide you with information on how to correctly setup the disinfestation station and a step-by-step process for conducting the cleaning and disinfestation steps. If you are hosting visitors, you need to be aware of the controlled conditions under which you may permit them to walk down vine rows. 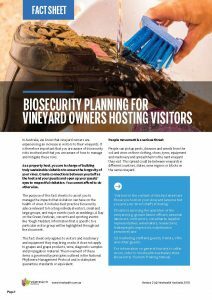 Click here for the Biosecurity Planning for Vineyard Owners Hosting Visitors fact sheet, which provides thorough best practice farm-gate hygiene advice (including handy flowcharts) relevant to hosting individual visitors, small and large groups and major events (such as weddings, Day on the Green, festivals, concerts and sporting events like Tough Mudder).